Each year, around Thanksgiving, we usually do a post on what we’re grateful for. This year, we’re turning it into a Question of the Week! And unlike past years where we’ve been grateful for the really BIG things in life (family, health, work, etc. ), this go-round we’re showing you that an attitude of gratitude can be about the little silly things, too — and that it can last all month and year long! There are a million plus one (plus one!) things to be grateful in this amazing world of ours. Large and small, I try to focus on at least a couple of them every day. And there’s no better way to bust out of a funk than by focusing on what you have. We all have SO much. So read on for a few of the lighterhearted and random things I’m grateful for … hopefully you’re thankful for them, too! Anything in and around Paso Robles. The sound of coffee percolating. Catching the sunrise after an early morning workout. The smell of new running shoes. My dog nudging me awake. A good glass of red wine. The sound of my own breath after a hard workout. Large mugs of hot cocoa — or, really, anything. Days when you feel like you could run forever. The crunch-crunch sound leaves make under your feet. People like this speaking their (and our) truth. Lists of random things to be grateful for! I love this, particularly #9 and #18! I’m grateful for so many things I try to make it an at least monthly feature on my blog. Here’s some highlights: http://trulymargaretmary.com/?s=grateful+for&submit=Search. 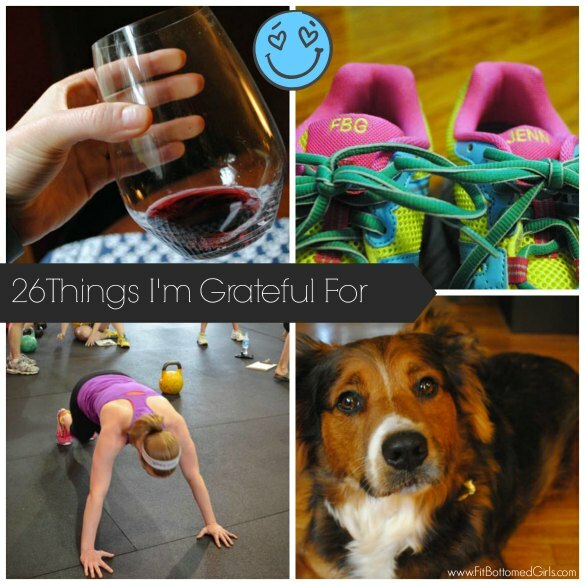 Next up on my grateful for list – the foam roller! Man, does that thing hurt so good on my sore IT band and hips!!! What a breath of fresh air! I have been practising mindfulness and intuitive eating for the past six months, with tremendous improvements in my psychological and physical health. I’m a huge fan of Geneen Roth and her teachings. She has inspired me in so many ways. I find your philosophy akin to hers, and so wonderful. Attached is my blog “Everything Tastes Better When You’re Hungry”. I am also grateful for my Apps, its strange thing to be thankful for especially with all my brain games, and my fitness apps.